Drawing on the knowledge and experience I gained from more than a decade reviewing and editing audio magazines, my goal is to simply provide enthusiasts like me with the best audio gear possible—to connect you with the music that touches your heart, mind, and soul. All the product lines at Distinctive Stereo have been carefully chosen to provide the best value at a variety of price points. 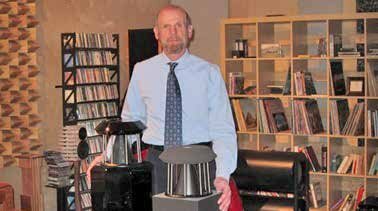 I’m happy to also be the North American importer of the German Physiks range of omni-directional loudspeakers. Spend some time perusing the site and products, then drop me a line and let’s talk about your dream sound system. We’re located in a quiet suburb of northern New Jersey, only 45 minutes from NYC, where you can experience the products by appointment. My goal is to connect you (and your families) with the music that touches your heart, mind, and soul. First and foremost, our goal is to offer products that represent the highest quality at their respective price points. It is well known that certain colorations and distortions are pleasing to the ear and brain, and we are aware that many audiophiles have become so used to such distortions that they feel something is missing when they aren’t present. Despite this, it is our firm belief that the role of an audio system is to accurately reproduce what is on the storage medium. While perfect reproduction is not currently possible, the products we represent are those come as close as possible, given practical constraints of price and size. We will not represent any products that intentionally color the music. Although the effect music has on us is magical, audio gear is not magical, nor is it mysterious. Accordingly, the equipment we represent is based on solid engineering principles, not mumbo-jumbo, nor snake-oil hype The term “synergy” arises frequently in high-end audio, and is often spoken of as being something mysterious and unpredictable. While component matching is most certainly important, we believe that it should be based on physics, plain and simple. While all components in an audio chain must interact properly, the two most important interfaces are amp-to-speaker, and speaker-to-room. We will make every effort to build systems based on this principle, as failure to do so is one of the most common causes of poor-sounding audio systems.